Two bombs, which partially exploded overnight, have been found outside a Army Reserve base in Londonderry. The improvised explosive devices (IEDs) had been left in bags near the fence of Caw Camp Army Reserve centre on Limavady Road. Police said CCTV footage indicated the devices detonated at about 23.35 BST on Sunday but failed to fully explode. They said the bombs, which were left close to houses in Rockport Park, had "the capacity to kill or maim". The abandoned bags were discovered at about midday on Monday and police began to evacuate nearby homes in Rockport Park and Caw Park. Residents, many who are elderly, spent almost ten hours out of their homes while Army bomb disposal officers examined the suspicious objects. Chief Insp Tony Callaghan: "An initial examination of CCTV footage in the area would indicate that the devices partially initiated at around 11.35pm last night but failed to fully explode. "No warning was received by police and with the close proximity of homes nearby this was truly a reckless act which endangered local peoples lives." He said inquiries were underway into how and when the bombs were left at the location. A police helicopter was deployed during the bomb disposal operation and the Foyle Arena leisure centre was made available to provide shelter for residents. The railway line between Derry and Coleraine was closed for most of the day because it runs close to the scene of the alert. 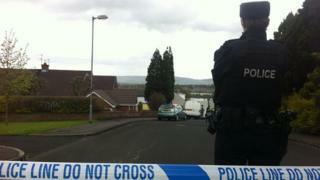 Reporting from the police cordon on Monday afternoon, BBC Radio Foyle reporter Anna Quigley said: "Sources tell me that those objects were in duffle bags, understood to have been placed at railings at the entrance to the [Army Reserve] base." She said Rockport Park is a dense, residential cul-de-sac of detached houses and people who live in the street had criticised those responsible for the alert. Police said the devices have now been made safe and have been taken away for further forensic examination. The alert has now ended and residents have been allowed to return to their homes.